In addition, we can organise and conduct full property clearances – the premises will be stripped of its contents in a matter of hours, not days. Our clearance teams will even sweep out the place after completing the job. For instances where a skip is required, customers can take advantage of our versatile and inexpensive skip hire – there are no permits or waiting periods, as we are a fully licensed, registered and insured junk removal company in Charing Cross. Our rubbish removals in Charing Cross are safe, practical and efficient – all work is carried out by trained and qualified technicians. Transportation of waste off the premises will take place in purpose-built waste removal vehicles of the appropriate size and load capacity. Waste will be collected from anywhere on the property. When it comes to cost efficiency of our junk removals in Charing Cross, customers can be sure to receive excellent coverage at moderate prices. We only charge for the rubbish we actually remove. We come out for onsite quotations as this keeps pricing fair and adequate. We provide customised pricing to cover specific budget requirements. The company applies an extensive recycle and reuse program for salvageable waste material, through which we aim to reduce the amount of waste ending up in landfills. We hold permits for using all recycling depots in the city, and will return waste transfer notes to customers if requested. Charing Cross is more of a junction rather than a suburb. The location marks the centre point of Greater London. 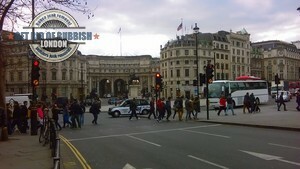 Charing Cross is just south of Trafalgar Square, right in the heart of Central London. Charing Cross indeed takes its name from a cross, this was the Eleanor Cross which once stood there. The cross was removed at some point, and since sixteen seventy five its spot is occupied by the equestrian statue of King Charles I. A relatively close replica of the medieval Eleanor Cross was erected nearby the statue. After the turn of the twentieth century, Charing Cross became the common name used for some of the surrounding areas and locations (besides the official Charing Cross names of stations etc.) At the moment, at least one property in the area retains the address Charing Cross which is the Drummonds Bank building.